"Some Childhood Wants . . . "
It's strange when you accost a few things in you life that remind you of your childhood . . . the nostalgia could be so painful that it would bring you at the verge of shattering into pieces. However, such pleasant memories remind you of how beautiful life was when you were a child. I chanced upon once such thing today. Yes . . . the picture that is uploaded is a drawing I made back when I was in class 1 and I have had a habit of keeping all my drawings and paintings with me. At times, the innocence of your childhood does not make you realise what weird things you are drawing or how they could be perceived and this is the stage of life when your imagination is probably the strongest and probably without barriers too. This is the concept I used to draw very often that showed an egg factory with eggs going down the conveyor belt and being packaged. Ah! branded eggs !!? It was during this time when I was 6 years old that I wanted a toy chicken that would lay an egg when it's button pressed. I know it sounds weird but one fine day such an imaginary toy came into my mind and I wanted it badly right there and then, I wonder why that habit of having something right away has still not abandoned me. Anyway, so I got on to the nerves of my father, maternal uncle and maternal grandfather urging then to get me such a thing. 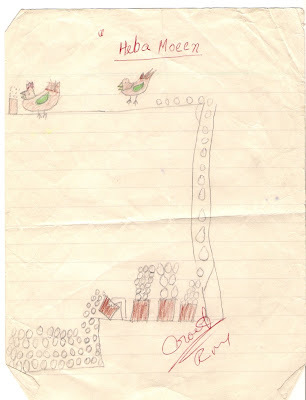 My grandfather even took me to a few shops to explain the shopkeepers what kind of toy chicken I was thinking of . . . For some days the efforts were rendered futile but surprisingly my imagination came to reality and such a thing finally did exist. All three of them got me the small plastic chicken each that had a hole on top for putting in eggs and when pressed would open up it's feathers to lay an egg one by one. It's surprising that when you think of that imaginary something that you need right there and then actually does exist in the market later on. Oh! A want was created and an urgent need extracted ! That time I didn't know I was going to be a marketeer but now I am . . . Some memories last forever and they make you realise how beautiful some moments really were . . .
Hopefully next year I will start summer camp for schools. Children can learn farming, growing vegetables, hatching and raising chicken, handling farm animals. Children these days ate spending more time in front of screens and gadgets instead of spending time in nature. So you can either join my program for learning or you can help me execute the idea.